Using Authority of the Resource Technique at the Barnes. We are so far from done with this implementation it’s hard to blog about it, but having worked on this for a year there’s a sense we’ll never be “done” and it might be good to release some of our progress. This post is about user experience at the Barnes — simply, what it feels like to be in our galleries as a visitor, techniques we are using, changes we’ve made, and some progress we’re seeing. Bonus, we’re releasing some materials that may be of interest — read on if you are curious. Just a year ago there were a lot of visitor restrictions causing friction in our galleries. We had a no photo, no sketching, no bags, no coats, and “stay behind the line” policies. All of these things were well intentioned and all were in place in the name of collection safety — a very important thing — but, still, it was a lot of “no” to those we were trying to welcome. And we were trying to tell visitors about all these “nos” before they would enter the collection. You can imagine what that felt like — before you’ve ever had an experience with a work of art, we’re telling you all this stuff you can barely remember and it’s all about what you can’t do. Our entry experience was feeling like an airline safety briefing. A lot of the internal dialog about these restrictions, including my own, centered around how “the Barnes is different.” There’s truth in this — the experience at the Barnes is different than any other museum — the rooms are immersive, you’re very close to priceless works of art, and twelve of the twenty-three rooms are incredibly tiny with just 100 square feet of space of standing room. 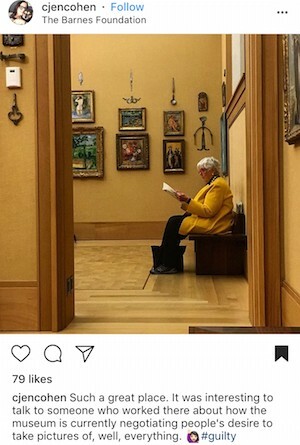 And, in fact, Barnes was never “museum” in the typical sense — it was created as a teaching facility and the installation environment created for small groups of classes, not necessarily typical museum visitation patterns. The Barnes was originally designed as a teaching facility and classes continue in our spaces to this day. Still, though, ya’ll know the idiom “if it walks like a duck and quacks like a duck, it’s a duck,” right? In the visitor’s expectation, the Barnes sure acts like a museum — it’s a place where you buy a ticket and go see art, it’s located on the Parkway where the museums are, we have exhibitions, we have a collection, we have tours, we have public hours, etc. Most visitors come into the Barnes and figure they can do what they do in most other museums — why should this museum be different? A duck is a duck. We started to sit down as a group — collections, security, visitor experience — and work and work and work on these things. I will admit, we (meaning me) actually started this process backwards thinking it was about our photography restrictions more than visitor experience, more generally. We embarked on almost a years’ worth of photography pilots to test various scenarios to allow it. In pilot after pilot, change after change, our group would come back together and discuss findings. We realized that simplification could help us. Work on the root cause— how close visitors are getting to works in the collection —and if we can nail the communication about “keeping a safe distance” we could let other things go because there would be less overall risk in doing so. As part of this process I spent a lot of time benchmarking with colleagues across the country. The Broad pointed me to their use of Authority of the Resource Technique (ART). ART is the technique that the National Parks Service uses to help train park rangers on communication with park visitors. Rather than telling visitors the “rules” they teach visitors how to protect the “resource.” In the national parks system, the resource is nature; at The Broad the resource is art. 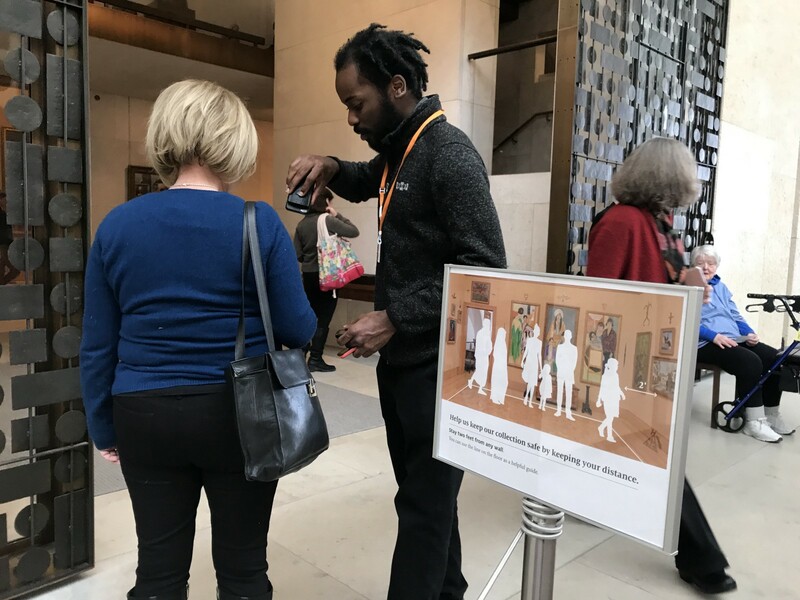 We started to train our entire floor staff including security on ART — this involved rewriting the original NPS document with art and Barnes-specific examples, peer-to-peer training with role play, and creating a pocket guide. The pocket guide is especially useful because we work with contracted security — new faces come in frequently and the pocket guide can help get these folks up to speed quickly. The pocket guide we created for Barnes staff as a quick reference on the go. Interesting to note, our first go round with ART didn’t work because it was conceptual. We simply distributed the original NPS materials and said we should adopt it, but many people had trouble making the leap from parks to art. It wasn’t until we re-wrote the guide to be Barnes-specific that it could be fully internalized in our day-to-day. Given that, I thought it would be good to release a bunch of things today in case it would be useful to others. 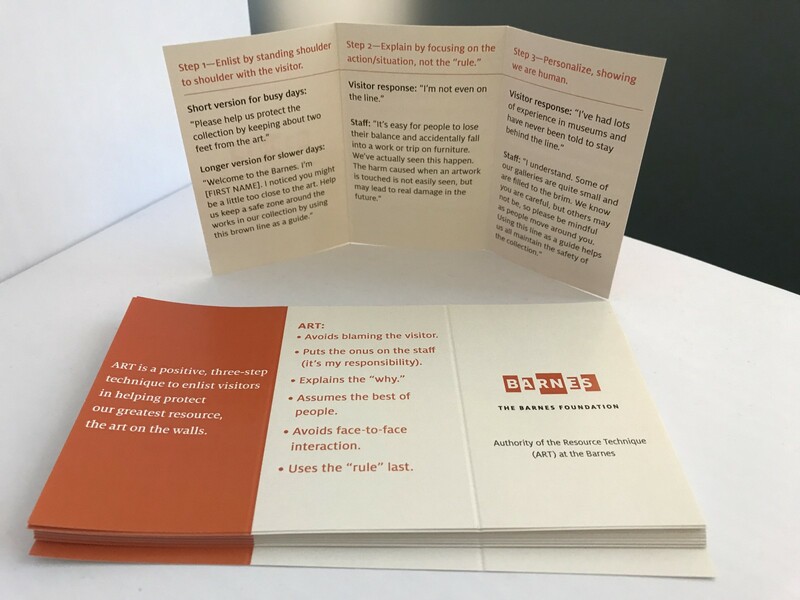 Here’s a folder with our ART re-write and a bunch of materials we created (described below) including a pocket guide, a welcome guide, training resources, and stanchion signage. And this brings us to today. We are working to communicate one thing — help us protect the art by keeping a safe distance — and we’ve let go of other things (photography and sketching are now allowed) in favor of communicating a single idea. Our own sign — based on the example from the National Parks Service, below — helps translate the same concepts in our own environment. Upon entry we welcome visitors and simply say “Help us protect the art by keeping a safe distance.” We point to a small sign to help illustrate what we mean and that’s it — you are on your way. 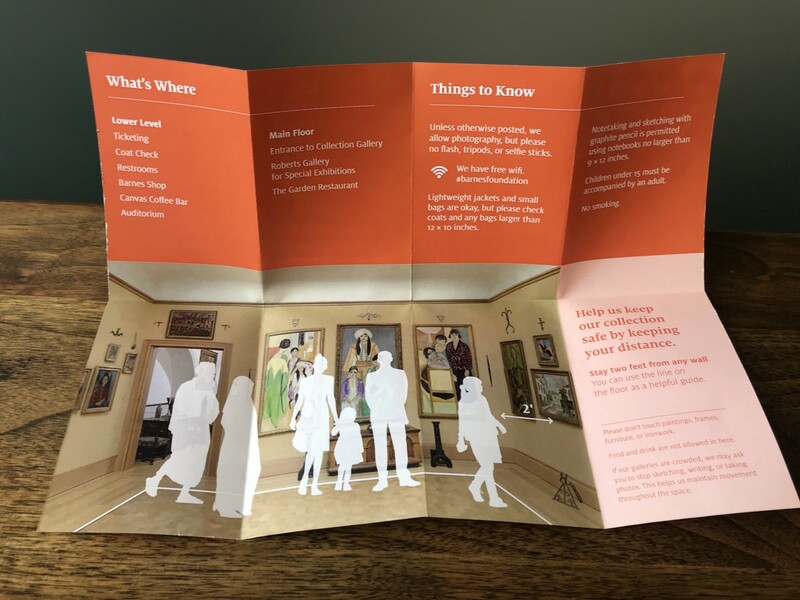 The Barnes welcome guide includes the same illustration that’s on the stanchion sign along with similar calls to action. The same illustration is also published in our welcome guide (above) reinforcing the visual and the call to action. 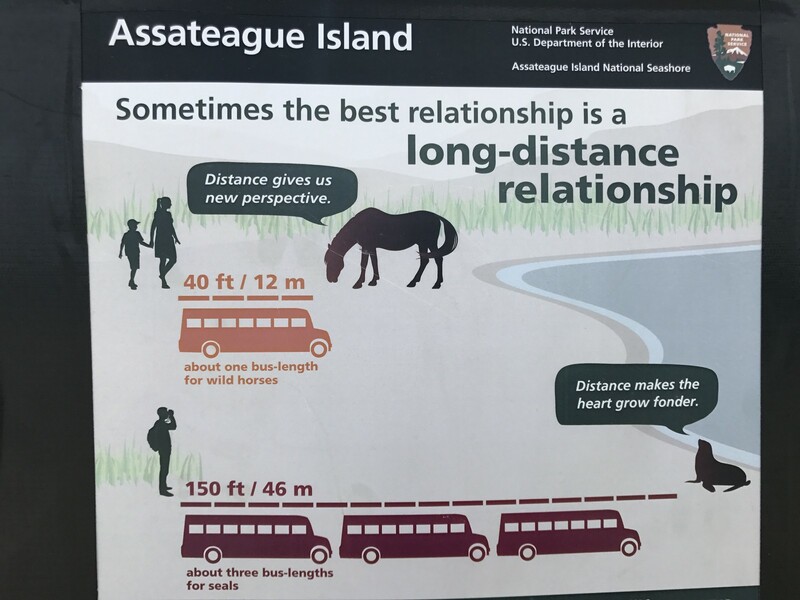 Incidentally, we should also note that the National Parks Service influenced our signage, too — they have a very clear design language helping communicate tough concepts like distance (below). We took this as a starting point and adapted it for our galleries. This is what I do on vacation — take photos of signage from the National Parks Service. Nice job here using Authority of the Resource combined with clear, fun visuals. That’s progress and I’ll take it. Lots of people to thank starting with Rich Cherry and Lauren Girard, both formerly of The Broad. Jim Kelly at the Brooklyn Museum, Scot Jaffe at OMCA, and Pat Grazzini at MIA — all for their time in letting me benchmark visitor experience challenges. Pam Birmingham for helping re-write the original ART guide with Barnes examples and, also, for training our first group of staff. Olivia Verdugo for designing our sign and welcome guide. Pauline Nyren for designing the pocket guide. Barbara Buckley, Vince D’Antonio, Al Holland, Bill Schaefer, Conor Hepp, the entire visitor experience team, the Art Team, and all of our security officers who worked with us and our visitors to pilot and pilot…and pilot. Consulting creative technologist working for @ofbyfor_all and @the_barnes. Headed to live in Marfa, Texas…. 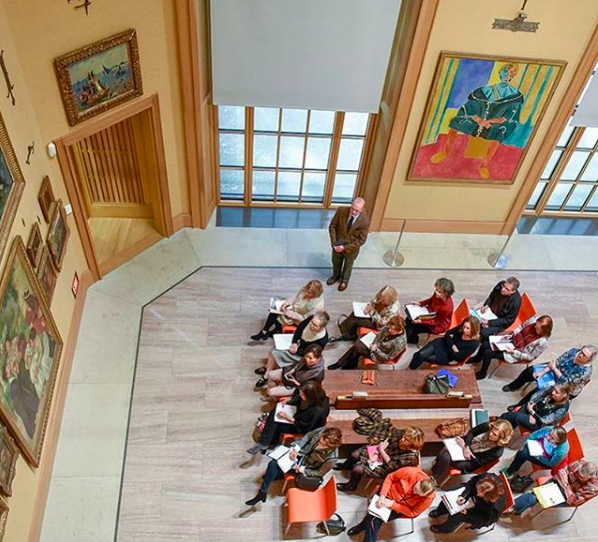 Visitor experience, digital content, and strategy from staff and partners of the Barnes Foundation.